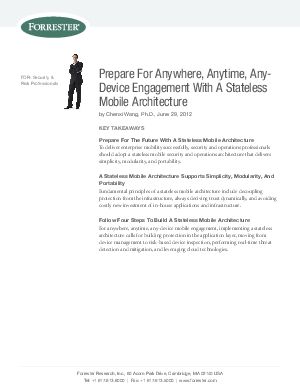 This report outlines Forrester's future look for mobile security and operations. We designed this report to help security and risk (S&R) and infrastructure and operations (I&O) executives understand and navigate the major business and IT trends that will affect the development of a future-proof mobile support strategy. Mobility holds the promise of fostering new innovations, reaching new audiences, and most importantly, creating never-before-seen user experiences and business opportunities. To stay ahead of constantly evolving mobile business requirements, S&R and I&O pros can't rely on the old approach of end-to-end control over the data path, device, and applications. Instead, they must embrace a "stateless" architecture where IT decouples security controls from the devices and the infrastructure, derives trust dynamically, and avoids costly new investment of in-house applications and infrastructure.